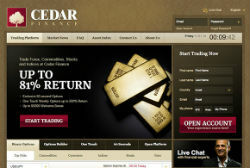 CedarFinance is a popular binary options broker that offers binary options for stocks, forex, commodities and indices. In all there are some 60 tradable instruments offered, from google and Coca Cola to currency pair EUR/USD and from sugar and coffee to the Hang Seng index. CedarFinance uses the Tradologic platform, as do several other binary options brokers. It has a reputation of being a stable and easy to use platform. Another nice touch is the CedarFinance e-book on binary options trading, a step by step guide that is freely available. The welcome bonus can be up to 100% over the first deposit. As with other bokers, the bonus can be used immediately but only cashed out after a certain trade volume has been reached. At CedarFinance this volume is 30x the amount of the bonus. The binary options trading platform Cedarfinance uses offers an Options Builder (allowing you to set up your own options), One Touch trading, Range Trading and Turbo Trading. The latter is for binary options with a very short run time, including 300 seconds, 120 seconds and 60 seconds - for those running on their third double shot of espresso. The platform is very clear and offers a quick view on price development and volumes for both put and call options being traded at the moment. The opening of a binary option position is very easy using the platform. Cedarfinace also publishes its own daily financial news. Though the quality of its financial news is higher than that of many other binary options brokers, it is no substitute for Bloomberg or Reuters financial news. CedarFinance offers several options for both deposits and withdrawals, among them credit cards, Skrill (Moneybookers), bank wires and local payment options. The minimum deposit is $200. The customer service is very friendly and available 24/7 through chat, email and phone. Cedarfinance has been in operation since 2010. It is currently not regulated. Cedarfinance uses a stable and easy to use binary options trading platform, offers an adequate variety of tradable instruments and a variety of ways to trade them. First time depositors can get a nice bonus, though you should take into account the bonus has to be ‘freed’ by trading a certain volume before it can be cashed out. We would prefer Cedarfinace to be regulated by CySec (since the company is based in Cyprus) though it does not alwasy have to mean everything when a broker is not regulated. The 24/7 customer service is a plus (several brokers offer only 24/5 service), as is the clear website and its wide selection of trading articles and videos, as well as the free e-book on the ins and outs of binary options trading.